Did you all have a good weekend? Ours was good. R's party was lot's of fun; and I was very thankful that it was at another location other than my house because it was nice to just be able to come home and unpack the presents and leftover cake and not have a lot of mess to clean up. DH is currently out of town for a couple of days, so my mom stayed with me last night and we had a bit of a girls night. We did some stamping, had some wine and watched the movie "Bride Wars." Sunday was a pajama day! Don't you love those? I got a lot of stamping done as well as it relates to working on my mother's day projects. I'm going to try to take some pictures of the projects and post them this week . I just have to figure it out with the camera, since they are 3D projects and I can't scan them. I have a hard time with the camera because I never seem to find the right place in the house to take the picture as it relates to lighting etc. Ok, so enough about that. Let's get today's card. 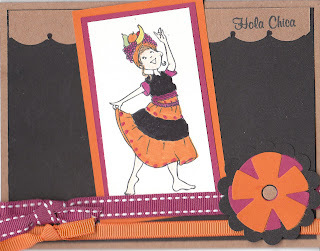 This is for Friday's WSC and also for Thursday's WTC challenge on SCS to use black cardstock. I got this new stamp from Paper Pretties last week also, and thought this would just be the perfect time to use it. The other colors I chose were Kraft, Pomegranate and Pumpkin Pie. I really wanted to keep the black as a dominant color which is why I chose to do part of the dress in it as well. I colored her in with markers, ink pads and blender pens. I did color her skin in a bit with some blush blossom ink; but it's hard to see in the picture. Ok, so that's all for me for now. I'm going to try to do Mojo Monday a bit later, so until then have a good morning! I think this card is so cute! love the colors!..I love this image, it's fun and fresh.. I love the pink and orange paired with black, it really makes those colors stand out. Very cute! I love pajama days too, I insist on having one once a month! What a cute image! Such a fun card too! TFS!! She is adorable--and just in time for Cinco de Mayo!